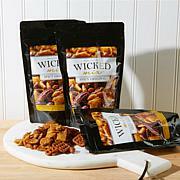 Kick it up a notch with this wicked snack mix. 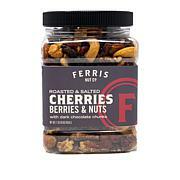 Our delicious medley of cashews, almonds, pecan halves, sesame sticks and other crunchy gourmet delights is glazed with a unique combination of rich and tangy spices, with the addition of smoky and flavorful chipotle peppers. 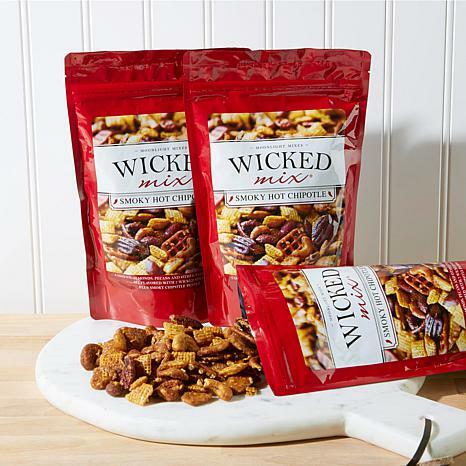 Your taste buds will tell you, this mix is wickedly good. 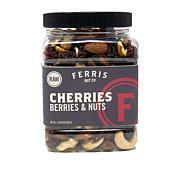 Contains almonds, anchovies, cashews, milk, pecans, peanuts, soy and wheat. Ingredients: Toasted Honey Nut and Wheat Crisps (corn meal, whole grain wheat, sugar, honey, soluble corn fiber, salt, canola oil, molasses, brown sugar syrup, natural and artificial flavor, potassium chloride, caramel color, natural almond flavor, sodium bicarbonate, sodium ascorbate, trisodium phosphate, reduced iron and zinc oxide, vitamin C, a B vitamin (niacinamide), vitamin B6 (pyridoxine hydrochloride), vitamin B2 (riboflavin), a B vitamin (folic acid), vitamin B (thiamin mononitrate), vitamin A palmitate, vitamin B12, vitamin D), cholecalciferol, cyanocobalamin. )), Honey Roasted Sesame Sticks (unbleached wheat flour (contains malted barley flour), soybean oil, sesame seeds, bulgur wheat, tack blend (maltodextrin, xanthan gum), beet powder, turmeric), Pecans, Butter, Honey Roasted Cashews (cashews, (calcium stearate (anti-caking agent), hydroxylated lecithin (processing aid), peanut oil, Honey Roasted Almonds (corn or peanut oil, modified corn starch), Sugar, Peanuts, Vegetable Oil Blend: (Palm and kernel oil, soybean oil) , skim milk, beta carotene (color), soy lecithin , citric acid, sodium benzoate and potassium sorbate (as preservatives). Pretzels (enriched flour (wheat flour, niacin, reduced iron), malt, natural flavors, yeast, soda), Worcestershire Sauce (distilled white vinegar, onions, anchovies, garlic, cloves, tamarind extract, natural flavorings, chili pepper extract), Hot Sauce (fully aged peppers, vinegar, and salt), Lard, Garlic Salt, Cayenne Pepper, Chipotle Pepper, Celery Salt. This is a great snack, very tasty if you like abit of 'fire' in your snack; not really hot but just a nice spicey touch...easy to carry. I was very disappointed in size of total order. 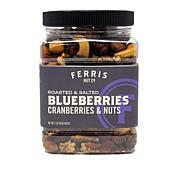 The product is very tasty just not enough of it.